The Voynich MS bears the ex libris of of Jacobus Hor&ccaron;ický de Tepenec on its first folio. In recent years, several additional books and manuscripts have surfaced which bear his ex libris with one version or another of his name. They are described in this page. For more information about Jacobus, see his biography . The following Table presents an overview of the five books and manuscripts that are known today, including the Voynich MS.
One conspicuous aspect of Jacobus' ex libris is that each book has been assigned a sequence number. They are indicated in the following Table, with additional information about the version of his name. The numbering appears to be neither alphabetical (by author), nor chronological. It strongly suggests that a list of his books should exist. This list or catalogue may also have been made as part of his testament, and some effort has been spent in trying to find his testament, but this has not been successful. It would be of great interest to see the description of the Voynich MS in this list. The number on the Voynich MS is not fully legible, but my personal best guess is 19. 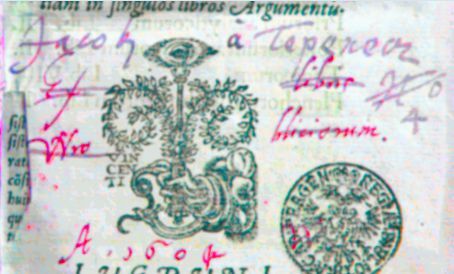 An important additional reference is a signature of Sinapius on a legal document. This was discovered by K. Slajsna and J. Hurych before the above ex libris. It dates from 1617, and is written manu propria. There are some obvious similarities and some obvious differences between the various forms of his ex libris. Even nrs. 2 and 3, which are almost identical and appear to have been written close together in time, show different forms of the initial capital J, which are also observed in his other ex libris. These two are both early forms, while the other four must have been written after 1608, given his use of 'de Tepenec'. For several of these books previous owners are known or indicated. 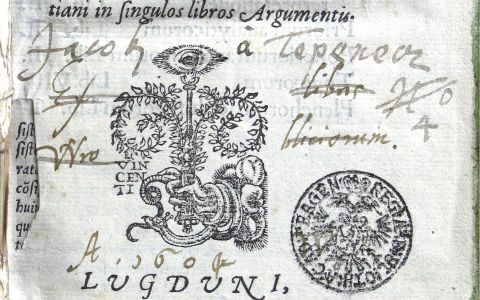 The struck out name on the Aristoteles book (nr.1) indicates that the previous owner was called Wroblicius, but we don't know if this is Albertus Wroblicius, co-author of "Disputatio Theologica De Verbo Incarnato" (1611). 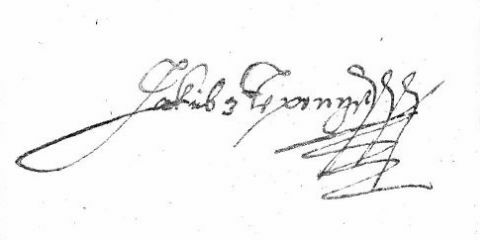 The document of M. Albertana (nr.5) was previously owned by Jiri Berthold Pontanus (d.1616). As is well known, the Voynich MS was (reportedly) previously owned by emperor Rudolf II. 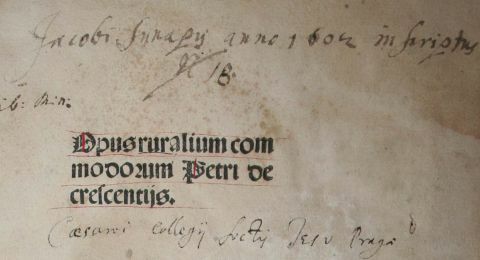 The year 1604 written on the Aristoteles book appears in contradiction with the use of the title 'de Tepenec', but a false colour representation of the page demonstrates that this year is written with the same ink as the ex libris that has been struck out, not in the ink of Jacobus' ex libris. Upon Jacobus' death his possessions were left to the Jesuits in his last will and testament. Consequently, all his books should have entered the library of the Clementinum. In effect, books 1-3 above all bear an ownership note of the Jesuit library, where books 2 and 3 must have passed to the Strahov monastery at a later date. I have personally scrutinused the entire first page of the Voynich MS under UV light, and can state that a similar line does not appear. Images of books 1-3 were kindly made available by the Czech National Library and the Strahov Monastery Library in the frame of the recording of the Austrian TV documentary (2009). Images of the Voynich MS were kindly made available by the Beinecke Rare Book and MS Library of Yale University, New Haven. The ex libris in book 1 was found by A. Sulzer. I am indebted to G. Landini for the false colour representation. The ex libris in book 3 was found by myself. The ex libris in book 5 was found by R.Prinke and photographed by P.Kazil. 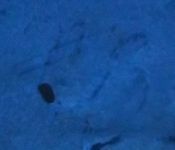 The legal signature was found by K.Slajsna and J.Hurych.